Wow! This hostal has been one of the few that really made me feel like home. It’s cozy, the staff is warm and helpful, it’s super clean and the location is perfect. And on top of all this: their breakfast is unbeatable! Great hostel, nice building and nice staff. Breakfast is awesome! The dog a bit weird. And atmosphere great, met some really nice travellers. Not a party hostel but many cool bars around. Would recomend! Beste ontbijt van onze reis, schoon en gezellig uitziend hostel. Door de kleine tafeltjes alleen lastig mensen ontmoeten. 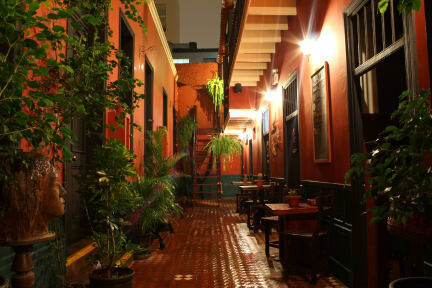 An oasis of peace and calm within the busy city of Lima, very clean! Beautiful and the plants and dog are awesome. Breakfast is very good, the homemade muesli granola is excellent and nutricious. A good taste of music as well, would definitely stay again! Nice place to stay. They arranged taxi from the airport, welcomed us at 3:00 at night. And served excellent breakfast. I recommend to stay at KACLLA! 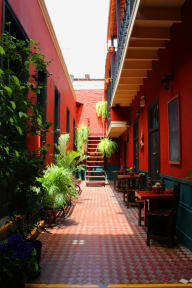 1) Style: the hostal is lovely decorated and they play proper and smooth jazz music - a real treat after all the reggaeton ;) 2) Staff: just good people, who are interested and helpful, and walk the extra mile if needed. 3) Comfort: the breakfast is one of the best I've had so far. It's their own tasteful bread (pita's), served with great peanut butter and more. Next to that: proper showers, beds and kitchen. Check out yoga down the beach (10 Sol). Nice hostel, good breakfast. Showers are hot safe and clean. Kitchen is great to prepare your own meals. Staff is friendly, and rooms and toilets are cleaned daily (or multiple times per day). Will return there. Goede voorzieningen, lekker brood 's-ochtends bij het ontbijt en erg schoon. Wel lawaaiig.